When faced with selecting a thermoplastic for a new component, I find it helpful to view potential materials in two groups …. amorphous (non-crystalline) and crystalline (strictly speaking semi-crystalline because it is unusual to get close to 100% crystalline). This helps me to focus in on three areas of properties. Firstly, amorphous thermoplastics have the potential for good transparency, unless incorporating pigments and fillers or blended with other thermoplastics. 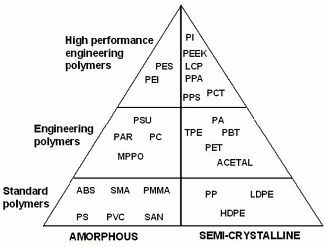 Semi-crystalline thermoplastics, in their natural state, consist of two phases (amorphous and crystalline). Each has a different density and hence different refractive index. So transmitted light will be scattered, and the optical properties will be translucent to opaque. It is possible to achieve transparency in semi-crystalline by an assortment of tricks, but high transparency is not the norm. The second area is chemical resistance or more specifically solvent resistance. Amorphous thermoplastics will dissolve in an appropriate solvent (similar polarity) whereas a semi-crystalline grade will not dissolve in any solvent at ambient temperature, although it may be subject to slight swelling and, in certain cases, environmental stress cracking. The third property is mould shrinkage. In their natural state semi-crystalline thermoplastics can have mould shrinkage values more than three times that of amorphous materials. However, this differential can be greatly reduced by adding fillers. A toolmaker will not be pleased if a designer makes a late switch from amorphous to semi-crystalline… or vice versa. Related Post What is Environmental Stress Cracking?